Sjáumst is Icelandic for ‘see you later’. And see you later it is, because I’m sure this is not goodbye. I left Iceland this morning and it has been a short trip but it has been amazing. I’ve seen a lot of beautiful places in Iceland. Sights I’ll never forget. I also met a lot of great people. Something I haven’t mentioned in my Iceland posts before. The people in Iceland are very friendly. They’re helpful and polite and at the same time they stay out of your business. Where people here in The Netherlands would gossip about someone having dinner or lunch by themselves it is very normal for people to do that in Iceland. There are no weird looks or talking behind your back. Instead, they are friendly, chat a bit if you’re interested in talking or leave you alone to enjoy your meal if you prefer that. You see a lot of people eating alone and some bars or restaurants even provide books or magazines for people to read while they eat or drink. I tried to eat at a different place every night, which was an easy thing to do. Reykjavik has a lot of restaurants. From fancy, expensive places to average priced places with good food and bars that serve food. My favourite place to eat though was Cafe Paris. I loved their food and have been back a few times for lunch or just drinks. Actually I enjoyed some good hot chocolate there earlier today with warm apple pie to warm up from the rain. I had some time left earlier today before checking out and waiting for my ride to the airport so even though it was rain was pouring down I wanted to spend my last few hours in Reykjavik buying some souvenirs for the family back home and visiting Hallgrimskirkja again. It’s not just a beautiful church but you can also take an elevator up to the top where the viewing point is located. You can look out over Reykjavik in all directions and it was something I wanted to do the first time I was there, it was just unfortunate that the viewing point was closed at that time. I sat there for a good hour warming up, having some more hot chocolate and thinking about the past few days. Iceland made an impression on me the first time I was there, back in 2010 during my stop over to New York City. And at that time I had only seen it from the sky and at the airport. It has made an even bigger impression on me now I’ve actually visited the country. It’s beautiful and I know what I saw is only the tip of the iceberg. There is so much more to see, so many more places to visit and the other side of the country has even more to offer. While I was there I stayed at Hotel Baron which is a small hotel located right near Saebraut. The path that runs from the old harbour to the new and all along the bay. 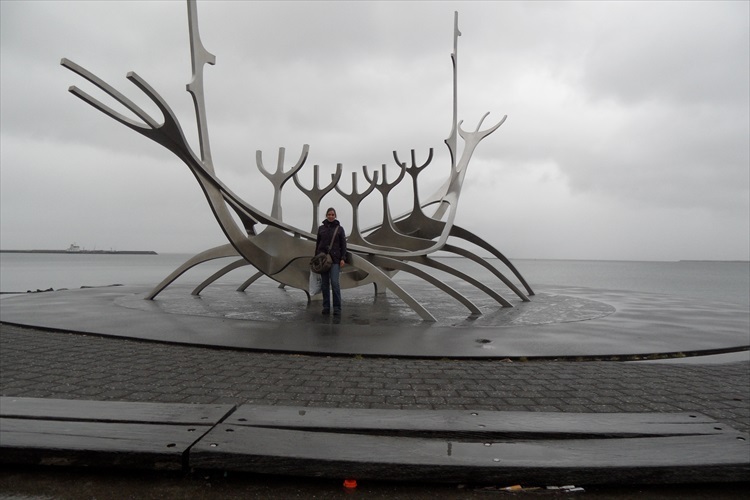 It’s a wonderful place to walk and enjoy the ocean and it’s also where the Sun Voyager, the Viking ship monument is located. Hotel Baron was good, it’s a great place to stay when you’re using it for a base to explore the city and the area around Reykjavik. It’s not luxurious but the rooms are clean and the breakfast is good, and for me that’s all I need. The staff is very friendly and helpful if you need to get anything arranged, whether that’s room related or excursions or tours. I’d say the only downside to this hotel was being awakened by the sound of the fire alarm (located right outside my door) a few nights. But I guess that’s just bad luck. There’s a supermarket located right around the corner too so it’s very conveniently located. I say thumbs up for Hotel Baron! So yes, Sjáumst Iceland. Because I will be back, it might not be in the next few years but some day I will. Until we meet again.